Cairns Jellyfish: Jellyfish are found in oceans, lakes and streams around the world, from America to Scotland, Japan to Australia and everywhere in between. There are freshwater jellyfish and those that prefer saltwater. Some jellyfish can be eaten, and are very popular on the menu in many Asian countries, while other jellyfish are dangerous to humans and should be left alone. Cairns Jellyfish live in tidal streams, on the Coral Sea and the Great Barrier Reef. There are many different kinds and they are usually most prevalent during the Cairns jellyfish ‘season’, which is generally from November to May. Why? Jellyfish prefer warm, tropical waters, so summer in Cairns Queensland provides ideal conditions. Unfortunately, their presence at the beach and on the Great Barrier Reef coincides with the best time of year for scuba diving in Cairns annd snorkeling in Cairns. Cairns Jellyfish, is it still safe to visit and dive and snorkel on the reef? Absolutely! Human beings and cairns jellyfish have co-existed in Cairns and on the Great Barrier Reef for hundreds of years (even before Cairns existed as a city). Yes, some jellyfish can give painful (and sometimes fatal) stings and they certainly deserve your respect and attention. But yes, steps and measures have been implemented by local authorities, researchers and tourist operators to maximise swimmer, snorkeller and diver safety on Cairns’ Great Barrier Reef and northern beaches, at all times of the year, including the ‘stinger season’. Barrier or stinger nets are placed in the waters off many Cairns’ beaches during the ‘stinger season’. At last count, there were approximately 20 such cairns jellyfish nets in the waters across North Queensland. The nets consist of a few materials, a floating “boom”, which visually marks the perimeter for swimmers and takes the net’s protection to the water surface, and the net itself, which is weighted at the bottom to sit on the ocean floor. Stinger / Lycra Suits are an excellent form of protection against a sting by Cairns Jellyfish, in all areas where they cover your body. As an added bonus, they also provide excellent protection from the sun and its rays, which is definitely something else to guard against during Cairns’ summer months. Cairns reef day tour operators take all necessary precautions to protect their guests from the effects of cairns jellyfish. Briefings are provided on the way to the Great Barrier Reef, giving you the information you need to be informed, and all operators offer guests a range of stinger / lycra suits for their comfort and protection. Suits are available in child to adult sizes. Some operators include these suits in their standard ticket price, while others will charge a nominal fee ($5 – $10). The stinger / lycra suits carried by Cairns reef day tour operators generally cover your feet and hands and most come with hoods, to cover your neck and head. Fashion wise, stinger / lycra suits carried by Cairns reef day tour operators come in a range of colours, from light sky blue to dark navy, red and even green. These may not look the best in your reef photos but they will provide protection from any cairns jellyfish you may encounter. Scuba diving the Great Barrier Reef can be enjoyed year round. As above, yes there are cairns jellyfish on the Great Barrier Reef, but this does not prevent you from diving. Knowledge is critical. All Cairns dive operators take their responsibility to educate their guests on the presence, dangers and protection against cairns jellyfish very seriously. Cairns Jellyfish are included in all dive briefings and marine presentations. Stinger / lycra / wet suits are provided to all divers and are included in the dive tour price. These suits (generally) will cover your hands, with some also covering your neck and head (with a hood) too. Suits are available in a range of sizes and are highly recommended, as they will protect all areas of your body covered, from the effects of a cairns jellyfish sting. How to stay safe? You must simply be aware that they are there, and listen to the instructions and precautions given and provided to you by your Dive Instructor and crew. Please note, cairns jellyfish can be found on the Great Barrier Reef throughout the year. They are a marine creature and naturally inhabit this environment, you are entering their world. Jellyfish are no more scary than a lionfish or stonefish (both dangerous marine creatures), it’s simply a matter of being aware of their presence and taking appropriate precautions. Generally speaking, box jellyfish on the offshore waters of the Great Barrier Reef are quite dispersed and the incidence of stings is very small. Interestingly, some box jellyfish are attracted to light and this is something to be aware of Cairns jellyfish when night diving with a torch. The Great Barrier Reef can be enjoyed by snorkelers throughout the year. Cairns Jellyfish do live in this natural marine environment, along with many other reef critters, such as sharks, sea snakes and octopus. Forewarned is forearmed and you can certainly snorkel in safety, enjoying the warm waters and colourful coral gardens and fish of Cairns’ Great Barrier Reef, from summer to winter. Cairns reef tour operators include cairns jellyfish information in all marine briefings, before you arrive at the Great Barrier Reef. They also have a range of stinger / lycra / wet suits on board, catering to adults and children. Some operators provide these to guests free of charge (included in the day tour price) while others will charge a nominal fee to hire them for the day. We highly recommend wearing the stinger suits – regardless of the time of year – as it will not only protect you from cairns jellyfish stings, but also provide sun protection in the tropical climate. Snorkellers do not need to fear cairns jellyfish on the Great Barrier Reef. Jellyfish are found around the world. It is simply a matter of listening to the advice and information provided by the Cairns reef operators and taking the necessary precautions during your snorkelling visit, to the Great Barrier Reef. Some notes: Box Jellyfish on the Great Barrier Reef are quite dispersed and stings are infrequent and uncommon. Box jellyfish can also be found in the waters off Cairns’ northern and southern beaches and their presence will be highlighted through signage at relevant times of the year. There are many different types of box jellyfish around the world and on the Great Barrier Reef. Research into these marine creatures is relatively new, and as such no one can accurately determine how many different species there are, with more being ‘discovered’ each year (many awaiting classification). However, there are 28 known species, three of which are capable of causing fatality in humans. These three live in the waters off Japan and Australia and in the Gulf of Mexico. The waters off Cairns and on the Great Barrier Reef are home to two types of deadly box jellyfish the Chrionex fleckeri and Carukia barnesi. The body of the Chrionex fleckeri (also known as the Australian sea wasp) can grow as large as a basketball with long tentacles (up to 15 per adult) trailing 3m in the water, extending from the edges of the body. Note: Only the tentacles of this creature have the dangerous stinging cells. Interesting Fact: This box jellyfish can swim at speeds of up to 3.35 miles per hour and the animal has eyes but no brain. The Carukia barnesi is a smaller example, so small that it can pass through the 25mm square mesh of the stinger nets, placed off Cairns’ beaches. With this critter, both the body and the tentacles have the stinger cells harmful to humans. These cells are called nematocysts and they contain a miniature harpoon which releases at its prey – fish and crustaceans (and unwary swimmers) – releasing a strong, toxin which causes paralysis. Firstly, to clarify something: Irukandji is the name given to the syndrome which human beings suffer when stung by particular types of box jellyfish (more details on this below). Globally, there are 12 to 16 known box jellyfish which will cause Irukandji Syndrome if they sting a human: 6 to 12 of these are found in Australian waters, including the Carukia barnesi referenced above. Generally measuring between 3-10mm (thumbnail size) with a single tentacle extending from each of the body’s four corners, these box jellyfish are most prevalent in warm tropical waters around Cairns. The Irukandji Syndrome is certainly not pleasant. Although the initial sting will be quite painless, within 5 – 45 minutes an affected person will start to have severe backache or headache and shooting pains in their muscles, chest and abdomen. Nausea follows as does sweating, spasms and vertigo. In severe cases, people may also have fluid on the lungs which can be fatal if untreated. 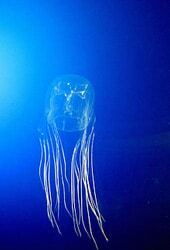 Annually, the number of people stung by jellyfish can vary anywhere from one or two to 200 people. Certainly, as above, the effects of a jellyfish sting are dangerous and can be fatal. They can also be avoided by taking the necessary safety steps and following the instruction of your dive instructors and Cairns reef tour crew. Vinegar should be applied immediately to any area affected by the cairns jellyfish sting, with medical advice sought from trained professionals. While vinegar may seem a strange way to treat the sting, it is very effective at disarming any nematocysts (stinging cells) which have yet to ‘fire’ into the skin. However, vinegar does not neutralise the effects of the box jellyfish toxin and is not an antidote: patients should seek medical attention as a matter of urgency. Notes: Vinegar is available and supplied on all Cairns reef day tour boats, free of charge. It will be administered by the dive crew and staff, who are familiar with its application and stings. If required, medical evacuation is provided by helicopter from the Great Barrier Reef, ensuring prompt attention at appropriate facilities. Jellyfish are found in the waters around Cairns and on the Great Barrier Reef, as well as waters right around the world. Many creatures that are naturally found in the marine environment, including stone fish, sea snakes, sharks and jellyfish can be fatal. It you are aware of jellyfish and take appropriate action (as outlined above and will be advised by crew in Cairns) then you can protect yourself from a jellyfish sting. In a worst case scenario, where you may have been stung by a jellyfish in Cairns, then professional medical staff and services are on-hand – no matter where you are – to provide immediate response, advice and assistance. If you have any queries in regards to Cairns jellyfish and snorkelling and diving with jellyfish on the Great Barrier Reef, please don’t hesitate to contact us for more advice and assistance.